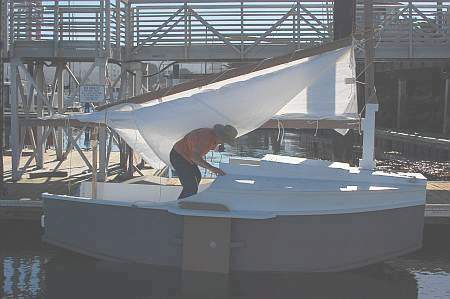 (15April2011)This issue will review rigging a sharpie sprit sail. The 1 May issue will be about small boat rudders. 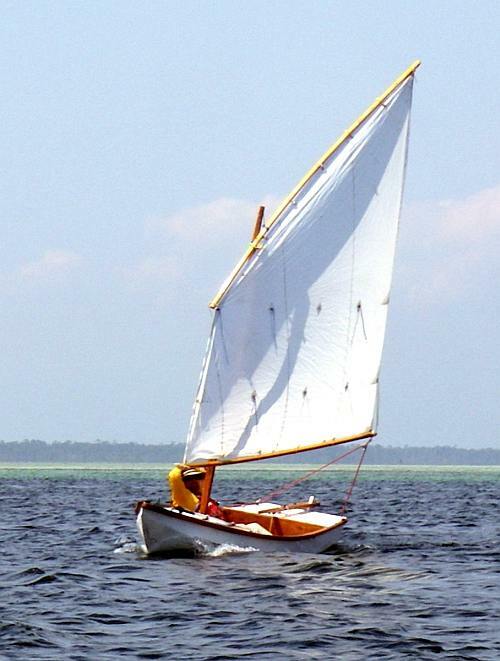 Noel Davis sails his Wooboto on the Florida gulf coast. Toon2 is in almost every way a multichine version of the AF3. I think these multichine hulls are more like round bilge hulls in that I keep the upper chine above any normal waterline so only the very easy lower chine flows through the water. 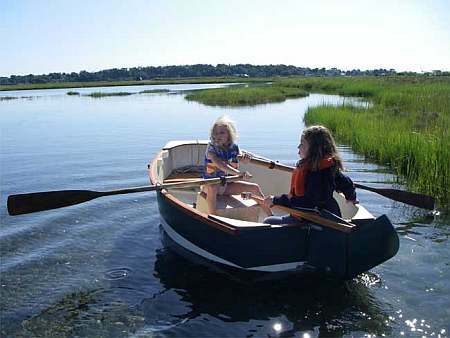 Other boats shaped this way such and Piccup Pram and Woobo have proven to be very fast and well behaved. 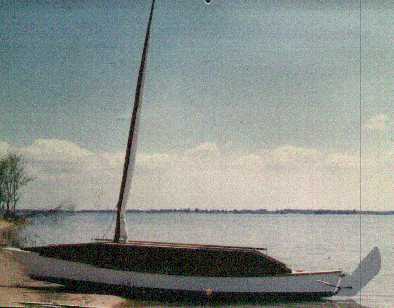 Yet they still have a flat center bottom plank that allows you to beach the boat upright. So one might think that a multichine like this is in every way better than a real flat bottomed boat, but that is not totally true. For one thing multichines have a few more pieces to make and must be assembled with taped seams. Taped seams are light and probably more rot resistant than chine log construction but they can be a bit harder to understand at first glance. And someone building a boat with his children might have second thoughts about the kids messing around with large pots of epoxy. Also the bottom plank of a multichine hull is a lot narrower than that of the equal flattie so floor space is reduced, a real factor if you hope to sleep two on the cabin floor, which you can't do with Toon2. Toon2 has about the same layout as AF3 but it is about 12" wider and I gave it some bench seats. 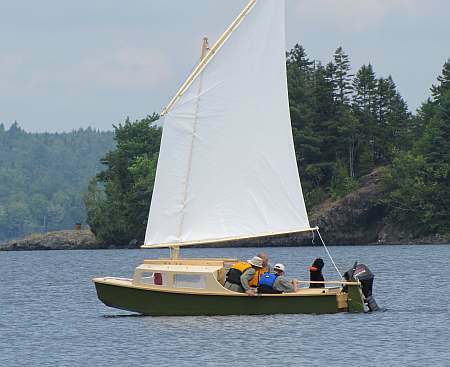 I'm thinking this will be an excellent solo boat for a short cruise with someone used to tent camping, and yet be a good day sailer for two or three adults, or maybe two adults and two kids. 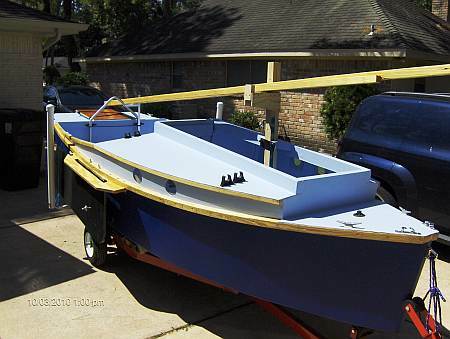 This size boat has always been popular and always will be because it has that sort of capacity and yet can be manhandled by a solo skipper in almost any condition. 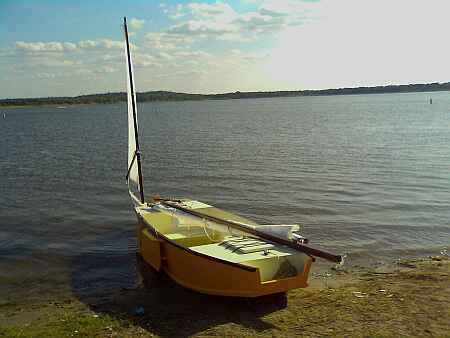 The sail rig is the same 96 square foot sharpie sprit that I used on Pencilbox and AF3. It started as the main on my old Bolger Jinni from 30 years ago. Very easy to make and use and efficient if you can live with a 21' mast on a 15' boat. As I am writing this there are two Toon2s afloat that I know about. Both were recently launched. This one by John Wolf in Texas..
...was made with the blueprint sharpie sprit rig. 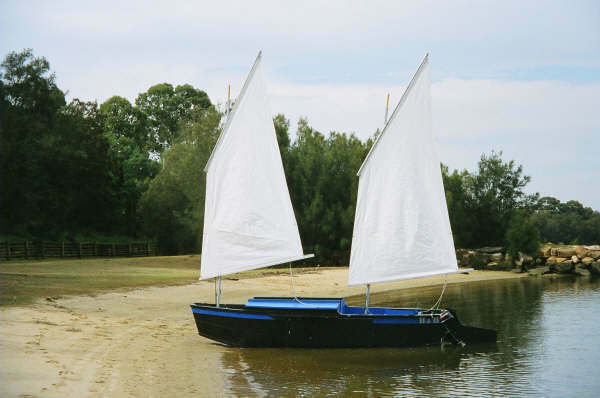 He says it sails fine. This Toon2 is also said to be a fine sailor. Compared to the stock sharpie sprit sail I would expect it to sail not so close to the wind. On the other hand it will certainly be easier to tow and set up and easier to reef and maybe be as good or better on the other points of sail. It's all the usual tradeoff. 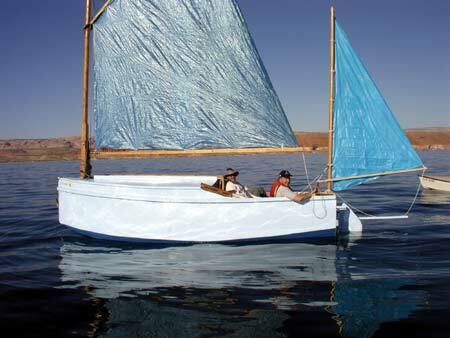 Note that it is not really a large boat and that the weight of the skipper in the stern affects the trim quite a bit. So with fine tuning she will be faster and better all around with the weight more forward. 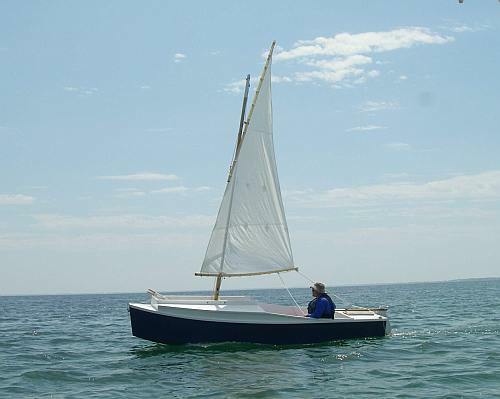 Then again, for lazing around on a slow day I found with my Piccup Pram that trim was not that critical and if the skipper lounged comfortably against the aft bulkhead, it looked bad but it sailed good. On its maiden voyage Mark's Toon2 was cruising all well with a Frolic2 and a Wooboto. Toon2 uses taped seam construction with no lofting or ladder building jig required. 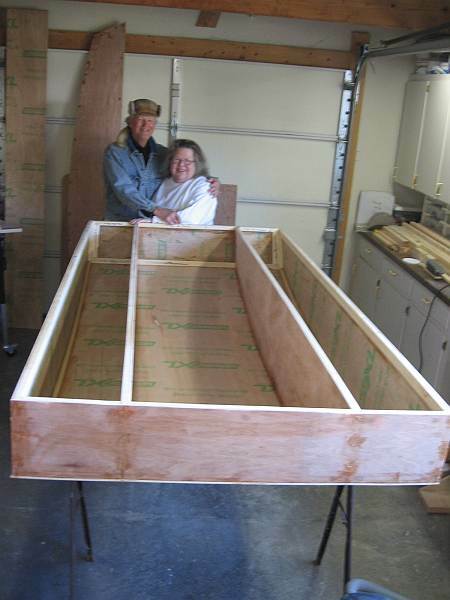 She needs seven sheets of 1/4" plywood and two sheets of 1/2" plywood. Plans for Toon2 are $40.